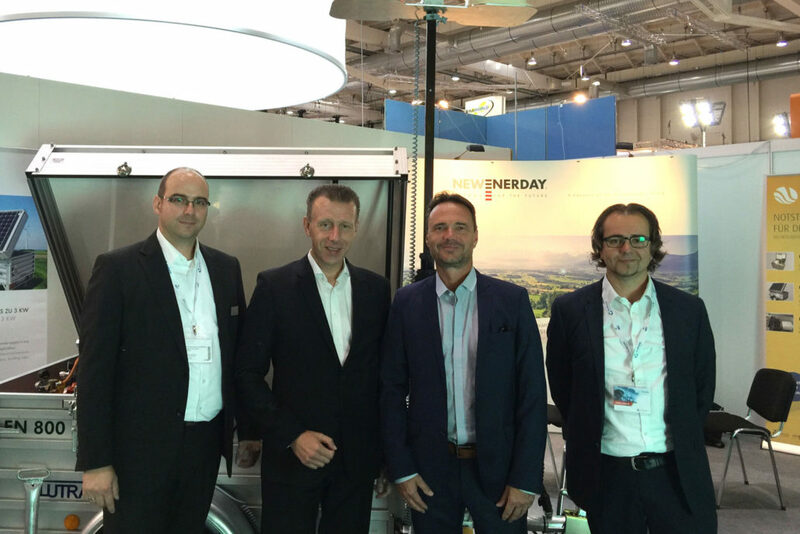 ENERTRAG system technology is incorporating the fuel cell systems of the Neubrandenburg-based manufacturer, new enerday, into its sales programme and will be selling them under our “Gridion” brand name on the wind energy market. The company WindEnergy 2016 concluded a corresponding agreement in Hamburg last Tuesday. As they are required, inter alia, for beaconing wind energy turbines during the construction phase or in the event of network shutdowns, Gridion fuel cell systems are deployed for an interruptible power supply. Using standard propane gas, new enerday’s fuel cells work as an energy source and, so that they can be conveniently transported to the operation site, they can be integrated into car trailers or crane boxes. With an on-board supply of propane gas, the fuel cells can operate for up to 600 days (8 hours per day) for a power consumption of 30 watts, for example, as is the case with LED beaconing. ENERTRAG Systemtechnik’s products can be purchased, hired and supplied within the framework of a supply contract. Founded in 2002 as an affiliated company of ENERTRAG AG, ENERTRAG Systemtechnik develops and supplies components for wind turbines. They mainly focus on beaconing systems for low-emission daytime and night-time markings, which are supplied to wind turbine manufacturers as original fittings under the brand name procandela. The airspex division offers services and technologies for needs-based marking, whereas the new Gridion division offers emergency power systems based on fuel cells.